Netflix and Verizon’s ongoing spat doesn’t look like it’s going to resolve itself anytime soon, and the biggest loser may end up being the customers of both firms. 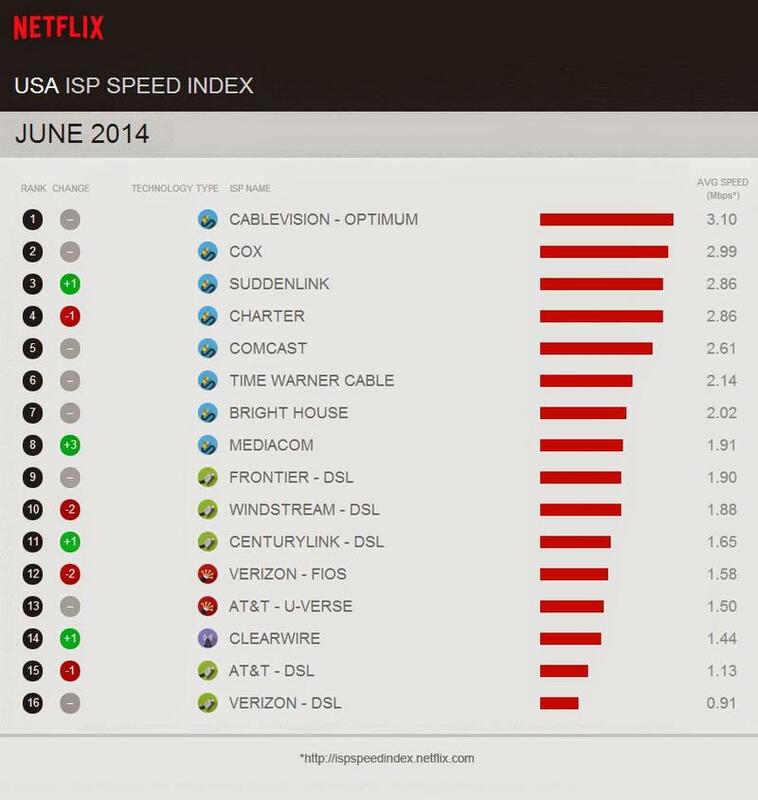 Netflix published its latest ISP speed results on Monday and Verizon managed to drop in the rankings. This happened even though Netflix pays Verizon to boost its streaming speeds. Verizon DSL dropped to the bottom of the rankings for U.S. ISPs, falling 13 percent from an average speed of 1.05Mbps in May to 0.91Mbps this June. Meanwhile, Verizon FIOS speeds dropped by 17 percent from 1.9Mbps to 1.58Mbps over the same time period. Netflix streaming speeds were expected to pick up after Verizon struck a deal with the company, but it looks like the new setup may not be finalized until the end of the year. By comparison, Comcast’s streaming speeds for Netflix quickly shot up after the company made a similar deal earlier this year. Even so, Comcast’s ranking fell slightly between May and June, dropping from 2.72Mbps to 2.61Mbps, though it’s still holding on in fifth place overall behind Cablevision, Cox, Suddenlink and Charter. Time Warner Cable is also holding on in sixth place with an average Netflix speed of 2.14Mbps. Meanwhile, AT&T is still stuck near the bottom of Netflix rankings for both its DSL service (1.13Mbps) and its faster U-Verse option (1.58Mbps). It looks like June was a rough month for Netflix customers overall. Hopefully streaming speeds improve in July.